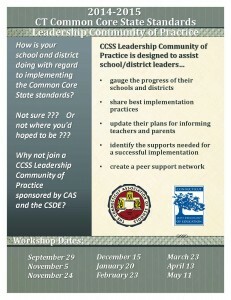 After a successful year one, the CCSS Leadership Community of Practice series will be offered again! Whether you were part of the team last year or are a newcomer, you are most welcome. If you want to learn more, or wish to reinforce CCSS implementation in your school or district, you are invited to join the CCSS Leadership Community of Practice sponsored by the Connecticut State Department of Education and CAS. The eight session series is offered without charge to school and district leaders and includes morning refreshments and lunch.